Recently the infamous denier website dailytech claimed that the sea ice has suddenly rebounded. In fact, he flatly states that there’s no downward trend, as proved by the fact that the value for December of 2008 is about the same (a little bigger, in fact) than the value for December 1979. Then he presents you with a whopper of a bill for his services. Fitting a trend line (with Excel or any other software) is a much better way to characterize the trend. 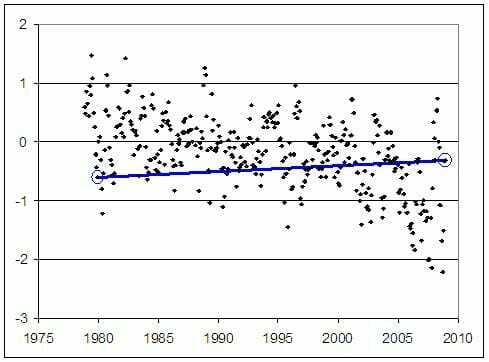 It turns out that the trend is statistically significant (strongly so), so we can conclude that global sea ice area has trended down in the 30 years it’s been monitored by satellites. 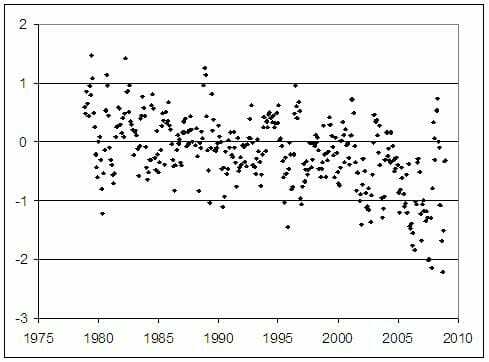 In fact there’s evidence that the rate of decline has increased, so the downtrend is actually accelerating — but the evidence is not yet statistically significant. We can certainly expect the future to show further decline, and we shouldn’t be at all surprised if it declines even more rapidly than it has so far. Time to get back to real science. It’s much more fun. 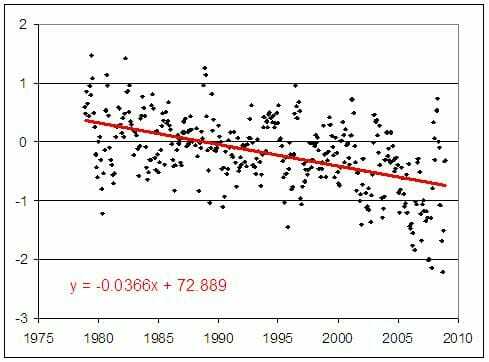 Arctic sea ice extent during the 2008 melt season dropped to its second-lowest level since satellite measurements began in 1979… Because ice was thinner in 2008, overall ice volume was less than that in any other year.